True story. I am a recovering cowboy junkie. For a good portion of my young adult life, no one was more in love with cowboys than me. In college, I had cowboy sheets. I think that they were meant for kids, but since the dorm beds were twin size, it never occurred to me that I was being completely ridiculous by buying them. 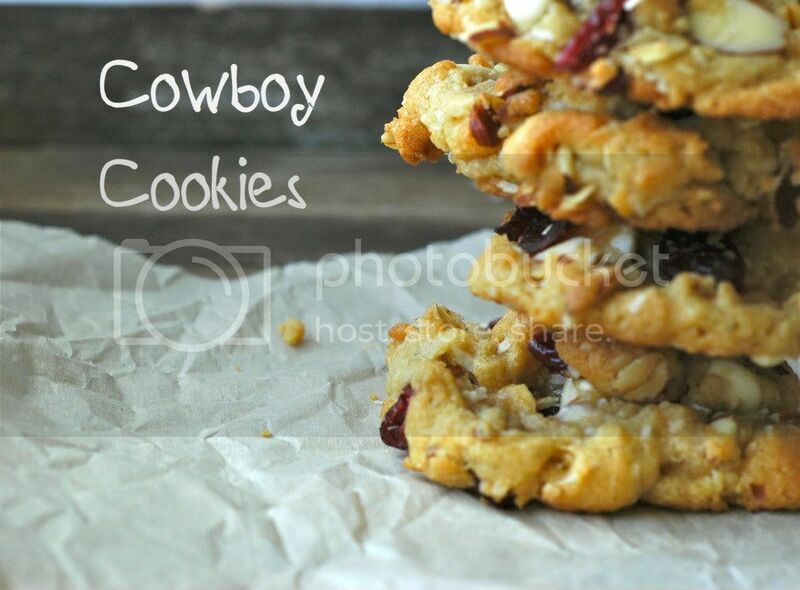 Wayyy into my cowboy obsession, I discovered cowboy cookies. Um yeah. Whatever year that was, I am pretty sure it was completely made by that cowboy cookie discovery. And since then, I've had many a cookie, but never made my own. I really wanted to call these cowgirl cookies, but then I realized that no one would know what the heck I was talking about. I discovered that there are a lot of people out there who have never even heard of cowboy cookies, so why make it more difficult for them to discover their scrumptiousness? Let me just say. These cookies are not for the faint of heart. They have a lot going on. I used a basic chocolate chip cookie base that is my go-to, and then just loaded those puppies up with goodness. 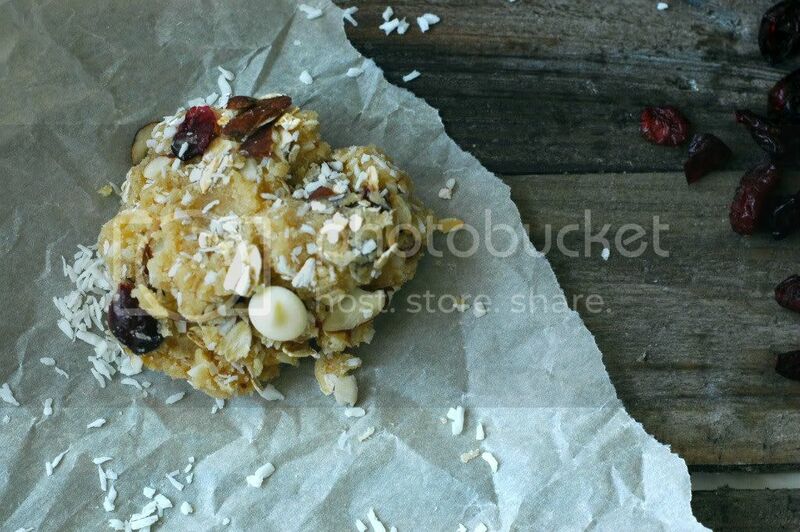 The combination of the oats, coconut, almonds, cranberries and white chocolate chips is intense. But it's so good. I also highly recommend mixing this cookie dough batter by hand - as in use your hands as the mixers. I almost always mix cookie dough by hand, because I think that mixers tend to over work the batter, which can result in a less than perfect cookie. Even if you just use the hand method after the butter and sugars are mixed, that works too and will make a big difference! Trust me on this. I think these cookies actually tasted better the next day, after they were given a chance to settle. Yes, I know that's something that houses do, but I am thinking it can apply to cookies too. Makes sense, right? Oh, and these cookies are amazing with chocolate ice cream. Which I may or may not have had for dinner dessert the past three nights. Preheat the oven to 300F (150C). 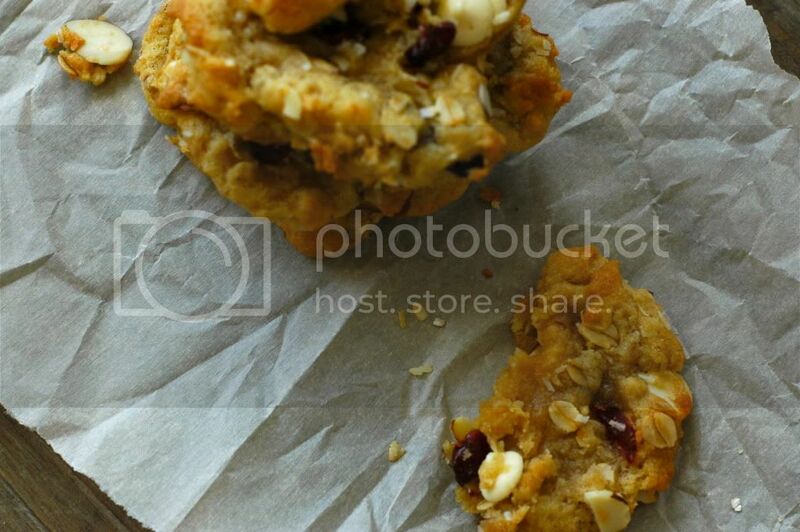 If you choose to, you can bake these cookies at 350 degrees, but watch them like a hawk if you do! Line two to three baking sheets with parchment paper and set aside. In a stand mixer, beat the sugars and butters together until smooth. With your hands or a spoon, mix in the egg, vanilla, and baking soda until just combined. Stir together the flour, salt, coconut and oats. Mix them into the batter until just combined (again using your hands or a spoon). 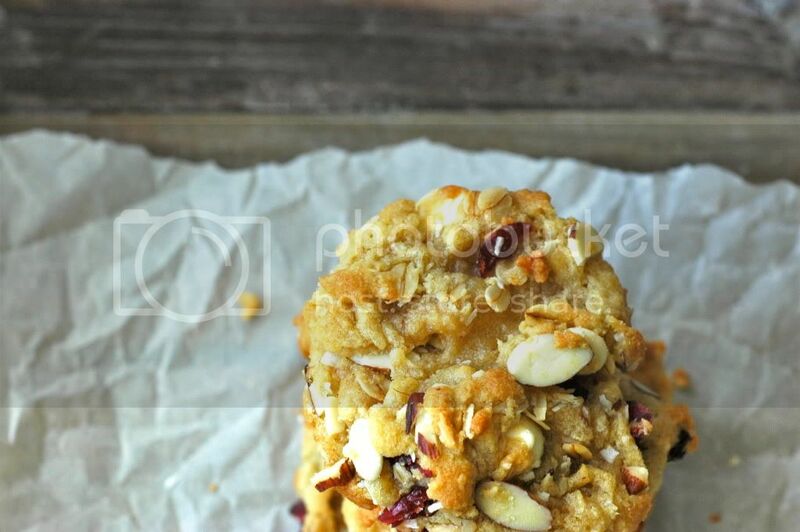 Mix in the white chocolate chips and sliced almonds. Scoop two tablespoons of cookie dough onto the cookie sheets, spacing them about four inches apart. Fill your cookie sheets according to their size. Most standard sheets will fit about 8 cookie dough balls. Bake for 10-12 minutes, or just until the edges become golden brown. Remove from the oven and let sit on the cookie sheet for a few more minutes where they will bake a little longer, and then move them onto a cooling rack.